All these “city eye” can be a bit of a gimmick, from London to Sharjah to Singapore, and quite recently, Dublin too. However, fair play to the other cities, the locations are quite spot on for wonderful bird’s eye view of the cities and their environs. For Dublin though, I’m not sure if the same can be said, which is a real shame. It’s hidden all the way down by The O2 (formerly The Point), an area not known for casual visitors but busy when there’s a (sold out) gig/show being played/ performed. Not only that, its location and size (it’s only half the height of London Eye) also means many landmarks of Dublin are not easily seen, given we don’t have many tall buildings and with most road being relatively narrow, from a distant, all the buildings easily blurred into continuous rows. Passing by to have a look at it carves a rather dejected sight. Not all the pods were lit and the carousel was not even in operation. Granted, it’s Monday today and I was there after its closing time. However, last week, when I was around the area on a Friday evening, it was the same. And according to the website, it should still be open until 11pm. 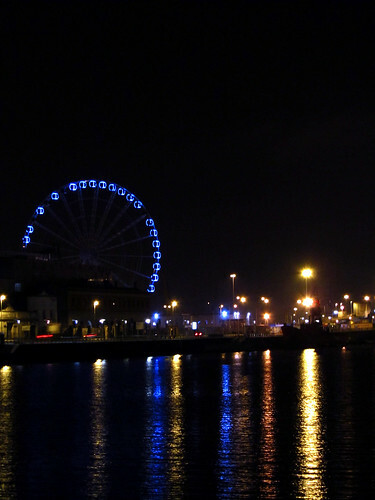 It makes me wonder – is Wheel of Dublin even in operation anymore?